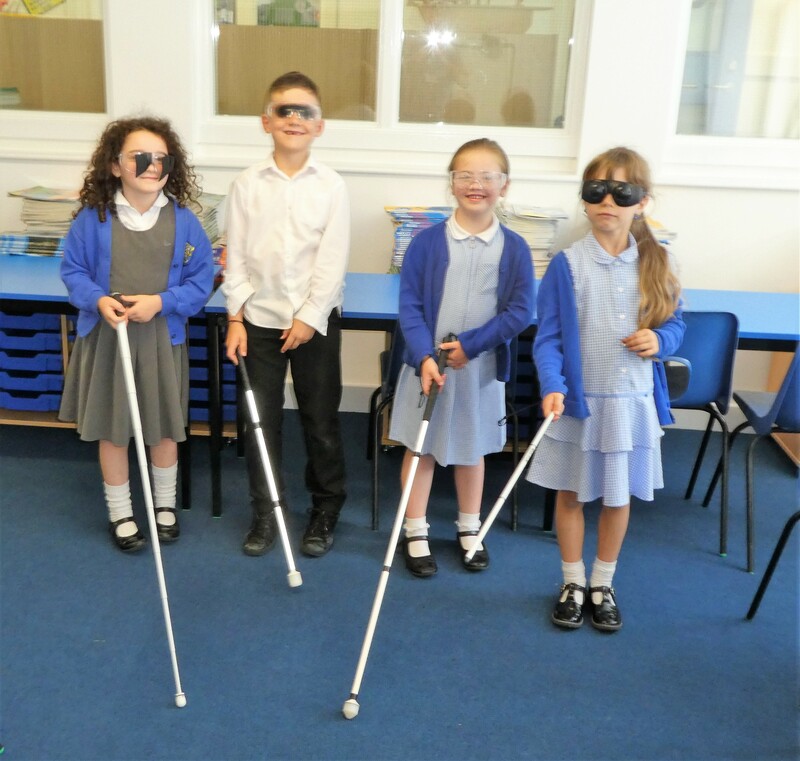 As an extension to our Sight Awareness work, we have developed a fun and interactive Sight Awareness Workshop for Schools aimed at KS1 (Year 2). The main aim of the session is to encourage children to be aware of others with Visual Impairments. We do this through talk, images and practical activities. This promotes children’s thinking about how people with Visual Impairments might see the world differently, and the challenges this may present. We also encourage children to think positively and recognise that people with Visual Impairment can be active and involved in daily life and leisure activities. We know that children learn best when they are engaged in active, first hand experiences. The session has been designed by a qualified teacher, to include practical, hands on exploration and opportunities to talk and express ideas. Our workshop should fit in well to any school’s PSHE provision. To promote an awareness of people with visual impairments. To encourage empathy with people with visual impairments. Identify the 5 senses by which they experience and explore the world around them. Talk about everyday things they use their sight for. Understand that some people may see/experience the world differently due to a Visual Impairment. Use positive language associated with sight/vision and Visual Impairment. Identify different symbols that indicate someone with a Visual Impairment. Talk about positive/helpful things they might need to do/be aware of in their interactions with someone who has a Visual Impairment. Recognise that people with a Visual Impairment can take part in and enjoy a range of everyday activities. What do we use our vision for during our day? The class is split into 3 groups of 10 with a member of Southampton Sight per group (+ teacher/TA to support). Children move around the 3 activities every 10 minutes. Canes & sticks – exploring different symbol canes/walking sticks/guide dog(toy). Simi Specs – wearing simulation glasses to look at the world through the vision of people with Visual Impairments. Feely Bag Activity – using the sense of touch to identify unseen things and to explore braille print. A review of the main points including the use of images of Visually Impaired people engaged in everyday/sporting/creative activities. Children receive a Southampton Sight Awareness Champion wrist band, promoting children’s participation and awareness. They also take home a leaflet to share with their families. This outlines what they have learned and promotes free eye tests for children. The session lasts approximately 1 hour. Please make it clear which school you are from and the number of Y2 classes you have. We have a set number of days allocated each term to run our Workshops. We will liaise with you to agree a day that we can visit you. WHAT HAVE SCHOOLS SAID ABOUT OUR WORKSHOP? The practical activities were highly engaging and clearly very well thought through.